Examples of general astrophysics drivers across cosmic epoch (Chapter 4) for three key HDST capability requirements: aperture diameter, efficient ultraviolet imaging and spectroscopy, and near-IR imaging and spectroscopy. 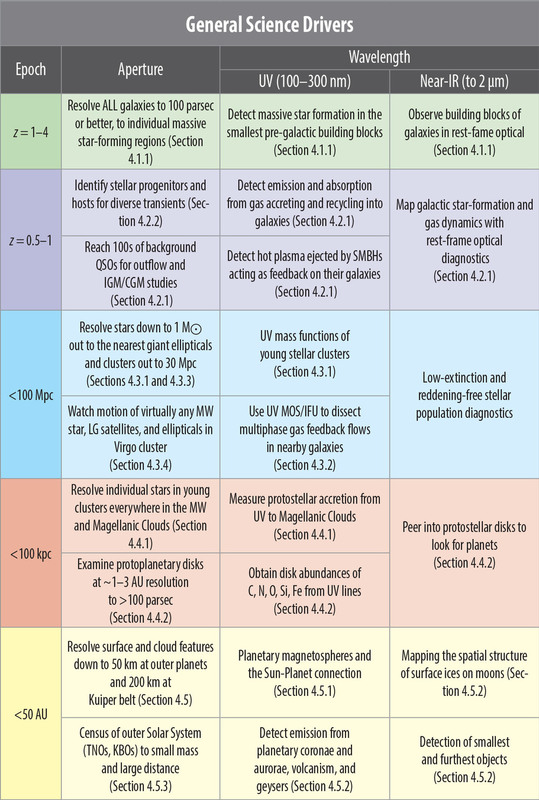 This science traceability matrix links HDST science investigations to key capability and instrument requirements (Exo-Im, Exo-Sp – Exoplanet discovery instrument imager and spectrograph; UV – High-resolution ultraviolet spectrograph; PI – Panoramic imager; MOS – Multi-object spectrograph). Detector capability requirement includes Photon counting (PC) and High dynamic range (Dyn Rg). The rightmost column provides a “typical” minimum count rate (in counts per second) per telescope or instrument resolution element (angular and spectral; not per detector pixel). Those observations requiring photon counting or high dynamic range are in bold. A direct, to-scale, comparison between the primary mirrors of Hubble, JWST, and HDST. In this concept, the HDST primary is composed of 36 1.7 m segments. Smaller segments could also be used. An 11 m class aperture could be made from 54 1.3 m segments. A folded 11 m primary mirror, constructed with 54 1.3 m segments, is shown inside a Delta 4-H shroud. 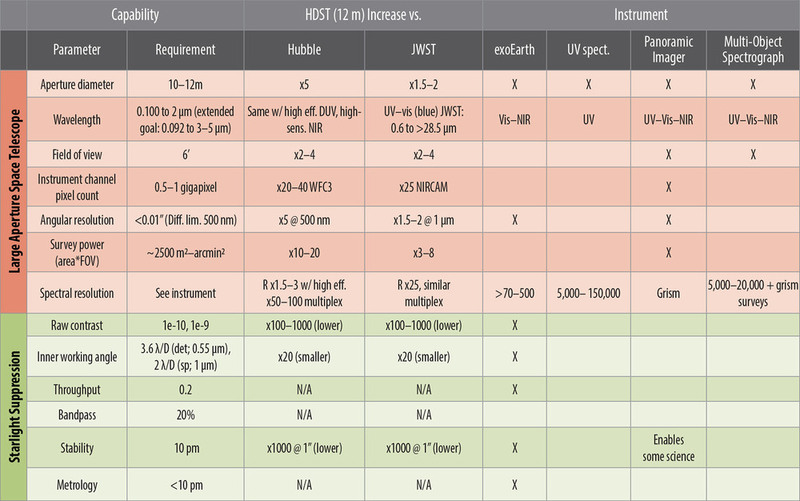 Comparison of physical sizes of existing and planned detectors with possible “usable” size of the full focal plane of HDST. Several channels of wide-field instruments (e.g., panoramic imager with 0.5–1 Gpix detectors and multi-object spectrograph; both with ~6' FOV) will share the focal plane of HDST.